One look at planet Earth on a map, or based on an image taken from space, ought to convey just how immense and important our oceans are. 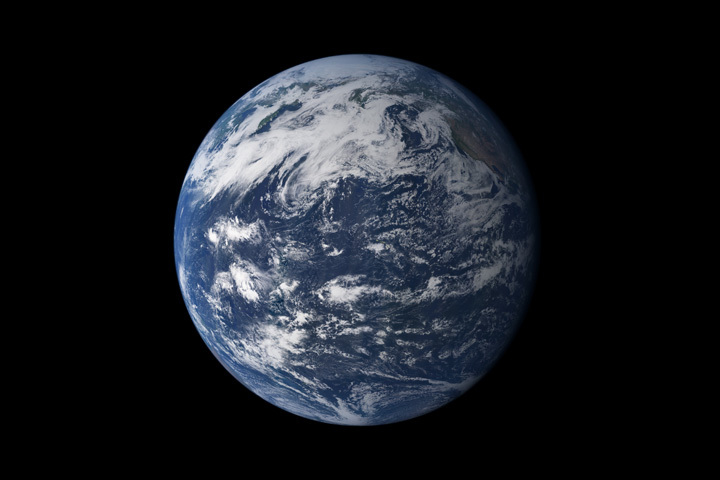 After all, they cover 72% of the planet’s surface, occupy a total volume of around 1.35 billion cubic kilometers (320 million cu mi), and are essential to life as we know it. And in their great depths, many mysteries still wait to be discovered. Thanks to modern science and improvement exploration vehicles, one of the most obvious has been tackled – which is the mystery of where the deepest ocean in the world lies. This is none other than the Pacific Ocean, which averages approximately 4,280 meters (14,042 ft) in depth and contains the deepest known part of any ocean – the Mariana Trench. Of course, determining the depth of an ocean is tricky business, and for obvious reasons. Ocean floors are extremely extensive, and vary widely in terms of elevation. Much like continental land masses, they have mountain ranges and trenches that throw off the curve. And in some cases, the trenches are much deeper than the average depth. However, in terms of average depth, the Pacific Ocean is the deepest. Though calculations vary, it is estimated that the entire ocean floor averages about 4,280 meters (14,042 ft), which is over 500 m (1640 ft) deeper than the global average of 3,700 meters (12,100 ft). Part of the reason for this is due to the Marian Trench, which is significantly deeper! 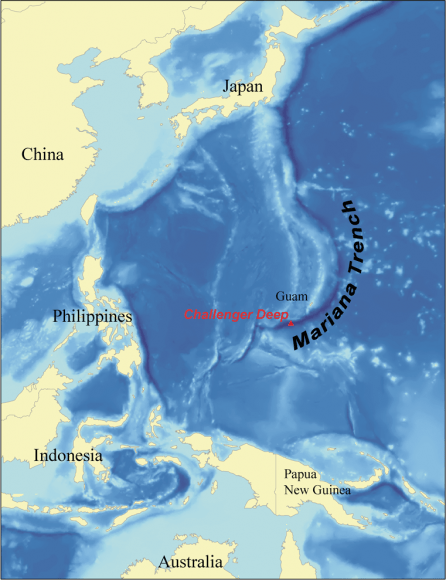 The Marian Trench is located in the western Pacific Ocean near the Mariana Islands, almost equally distant from both the Philippines and Japan. The trench is crescent shaped, and measures roughly 2,550 kilometers (1,580 mi) long with an average width of 69 kilometers (43 mi). It reaches a maximum-known depth of 10,994 meters (36,070 ft) – with a margin of error of 40 metes (130 ft) – at a small slot-shaped valley in its floor known as the Challenger Deep, located at its southern end. Countries near the trench include Japan, Papua New Guinea, Indonesia and the Philippines. The geological feature is the result of subduction that occurs at the boundary between two tectonic plates – the Filipino and the Pacific Plate. This results in what is known as the Izu-Bonin-Mariana subduction system, where the western edge of the Pacific Plate is subducted (pushed under) the smaller Mariana plate (part of the Filipino Plate). The movement of the Pacific and Mariana Plates also led to the formation of the Mariana Islands, which are volcanic in nature. They formed as a result of flux melting – i.e. where water cools hot lava – due to the release of water that was trapped in the subducted portion of the Pacific Plate. To put just how deep the Mariana Trench is into perspective, let’s consider comparing it to Mount Everest. If you placed Mt. Everest inside the Mariana Trench, there would still be over 2,000 meters (6562 ft) of water covering the mountain. The water pressure in the Mariana Trench is also 15,750 psi, which is more than 1000 times greater than the standard atmospheric pressure at sea level. This means that if you could stand at the bottom of the Mariana Trench, the pressure could literally crush you! Numerous measurements of the trench have been taken over the years using different methods. The first mission was the Challenger expedition, which took place between 1872 and 1876. Using the sounding technique, they measured the deepest point of Mariana Trench to 9,636 meters (31,614 ft). The HMS Challenger, which conducted the Challenger II measurements of the Mariana Trench. Credit: Imperial War Museums. This was followed by the HMS Challenger, which conducted the Challenger II survey in 1931. Here, surveyors relied on the more accurate technique of echo-sounding, and retrieved a deepest measurement of 10,900 meters (35,760 ft). This area came to be known as the Challenger Deep. During the latter half of the 20th century, multiple missions would be conducted. In 1957, the Soviet vessel Vityaz obtained depth readings of 11,034 meters (36,201 ft) at a location named “the Mariana Hollow”. This was followed in 1962 by the US merchant vessel Spencer F. Baird, which recorded a maximum depth of 10,915 meters (35,810 ft) using precision depth gauges. In 1984, the Japanese survey vessel Takuyo used a narrow, multi-beam echo sounder and reported a maximum depth of 10,924 meters (35,840 ft). In 1995, another Japanese vessel – the remotely operated vehicle KAIKO – reached the deepest area of the Mariana trench, thus establishing the deepest diving record of 10,911 meters (35,797 ft). In 2009, the US research vessel Kilo Moana conducted the most accurate measurements of the Mariana Trench to date. This involved using sonar to map the Challenger Deep, which located a spot with a maximum depth of 10,971 meters (35,994 ft). Four missions have been made into the Mariana Trench. The first was the Trieste, a Swiss-designed, Italian-built, and US Navy-owned self-propelled submersible craft. On January 23rd, 1960, the craft and its two-man crew reached the bottom of the Trench, having reached a depth of 10,916 m (35,814 ft). This was followed by the unmanned Kaiko craft in 1996 and the autonomous craft Nereus in 2009. The first three expeditions directly measured very similar depths of 10,902 to 10,916 m (35,768 to 35,814 ft). The fourth mission took place in 2012, where Canadian film director James Cameron mounted a mission using the submersible Deepsea Challenger. On March 26th, he reached the bottom of the Mariana Trench. Several more missions have been planned as of February of 2012. These include Triton Submarines, a Florida-based company that designs and manufactures private submarines; and DOER Marine, a marine technology company based near San Francisco that plans to send a two or three-person sub to the seabed. Beyond the coastlines, the world’s oceans are deep and unfathomable. Much of it remains unexplored and the life that scientists have found there is quite exotic (and may even provide insight into life on other worlds). Somehow, it seems appropriate that life in “inner space” would help us to understand life in “outer space”. We have written many interesting articles about the Pacific Ocean here at Universe Today. Here’s How Many Oceans are there in the World?, What Causes Tides?, Did Comets Create the Earth’s Oceans?, and What Percentage of Earth is Water? If you are looking for more information, you should try this article from National Geographic on life in the Mariana Trench and this website on the Mariana Trench. Astronomy Cast has an episode on the subject – Episode 51: Earth.